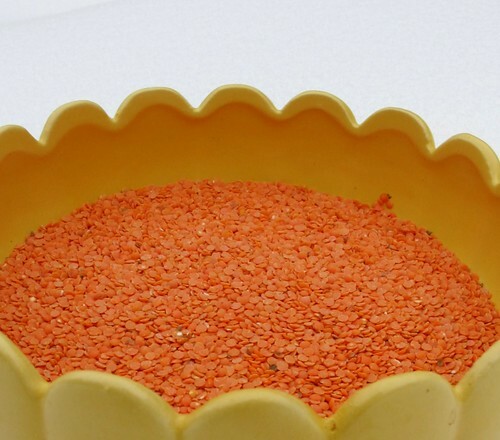 -Fill a large pot with and 2 inches or so of dry lentils. Rinse until the water runs clean. This is the most time consuming part of the entire soup process, and will take several rinses. The water will get foamy. Swish your hands around in it. Clean those lentils. -Drain. Fill the pot a little more than half way with water and bring to a boil. Do not cover. Watch your pot well. It will bubble over if not attended to. The kids love reporting that it's getting ready to erupt like a volcano. That's when I run to the pot with a ladle and bowl to skim off the foam and turn down the heat just a little. -Now it's time to add your chopped potatoes, carrots, and celery. We put onions in everything, but rarely do they end up in this soup. If you feel like it, go for it. -If it looks like it's getting too thick add more water. Cook until lentils have dissolved into a lovely golden puree. This happens surprisingly fast. I meant to time it for you, but I got distracted... and then they were done. After all of these years I've never clocked it, but I'm thinking 30-40 minutes. -Turn off heat. Ladle about a cup of the "thick broth" into a blender with several tablespoons of miso and a clove of garlic. Blend until smooth and pour back into the pot. Taste. If you want it a little saltier, just add a little more miso. Miso is a living food with restorative powers, try not to over cook when re-heating your soup or it will destroy the good micro-organisms. Serve with cracked pepper, crusty bread and a salad... or add some greens to the soup in the last 5 minutes of cooking. I know the ingredients list is short and not overly impressive, but I believe that the simplicity is the secret to why this soup works as a perfect comfort food on a cold winter night. Variation: omit the potatoes, add more water and some cooked noodles... and you have a delicious and healing alternative to chicken noodle soup. Have a warm and healthy day! I have been on a mission to clear out my pantry, using up what I've got in there rather than running to the store every other day. I've used up the cannelini beans, the black beans, the garbanzo beans, almost all the rice (I had three or four types) and guess what's left? 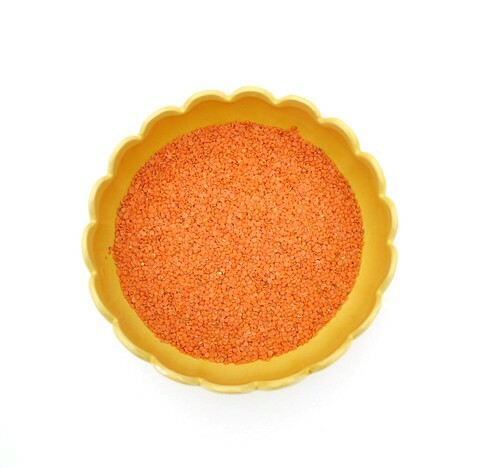 Red lentils! Thanks for the recipe, I have everything I need to make it besides the miso paste, and I think I can substitute something else for it. Hope you are staying warm! How perfect is that? Try using tamari instead. Oh, thank you so much for posting this recipe. I have everything to put this together for tonight's dinner. I think my family will love it. Thanks! I don't have lentils on hand because I'm the only one who likes them, but I will defiantly make this soup anyway next week--I've added them to my shopping list. At the very least, I can eat it for lunch all week myself. I love a good, naturally gluten free recipe! Is that the same Garden of Eatin' that sells corn chips and other stuff now? amy- yes, the very one! We were a "fast food" vegan cafe... tempeh burgers and air fries were the speciality... lots of macro, vegan and gluten free dishes. I was in my early 20's and it was an exciting place to work... lots of good memories and stories. Ah, yes! I was hoping we'd get the soup! Sounds divine; we'll definitely be adding it to the menu this week. How is the snow there? It is a sparkling, sunshiny morning here. Yay! Just made this soup for lunch and it was delicious. Very fast and easy to prepare. Love all your recipes, but you already knew that... Thanks for posting this one. Oooh! I am definitely going to try this one. I already have all of the ingredients on hand! I do love those red lentils! They are so pretty! I just made a big batch of Curry red lentil soup that called for similar ingredients to your soup but with curry instead of miso and a little ginger and lime juice to finish it off. I used winter squash instead of carrots and boy is it hearty and tasty. I'll have to give your variety a try next time. Thanks! Yum! That first photo looks like a big healthy winter sun. I adore that photo of the lentils from above - gorgeous. So abstract, yet detailed, and full of meaning for the warmth and goodness those lentils provide. Bravo! I am at my desk making out a grocery list when I came across this-perfect. thanks for sharing. your photos gorgeous as well. I'm so pleased so many of you are going to give this humble a recipe a try! Kathrin(Annekata), I was going to e-mail you about this one... you beat me to it! I usually make a curried (brown) lentil soup which my husband loves and even my two youngest enjoy. I am excited to try this! ps- we LOVE your grandmother's apple cake recipe. 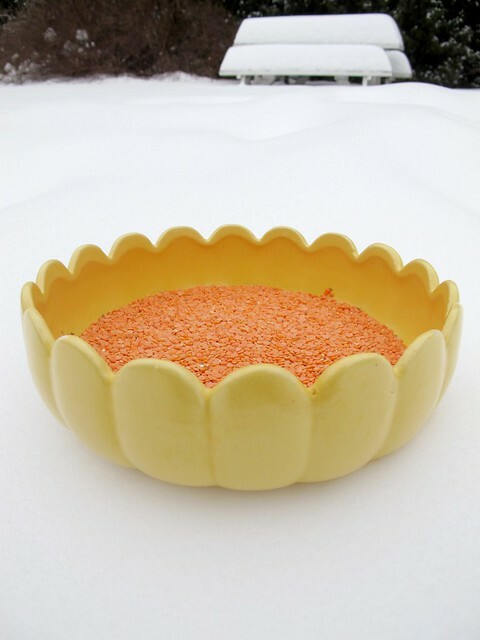 I LOVE that photo... sunshine in the form of red lentils!!! Cannot wait to make this satisfying soup! This dish was supper.keep it. I've never had red lentils before but this recipe makes we anxious to try them! This was so satisfying and delicious on our spring snow day today! Thank you for a wonderful recipe!